Last year we launched Spark Salon, our annual fundraiser and paddle raise, to much success. It is a chance for us to share our mission with you while enjoying delicious food, wine, live music, and inspiring conversation. 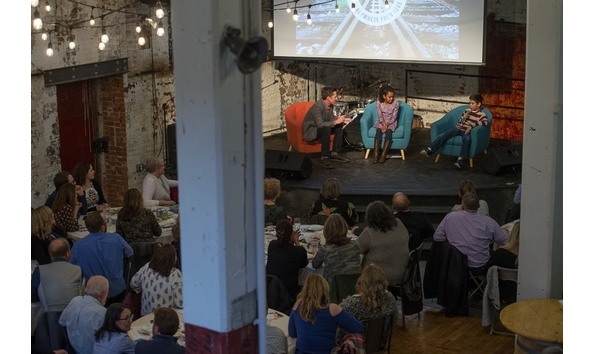 Every year, one of our co-founders, New York Times Best-Selling author and Spokanite Jess Walter, sits down with inspiring and innovative guests with Spokane roots in order to raise funds to keep our youth programming, community events, and membership available at no cost. Each ticket includes heavy appetizers and a glass of wine. PLEASE EMAIL kate@spark-central.org TO BE PUT ON THE WAITLIST FOR LAST MINUTE CANCELLATIONS! Fill in your table guest information to the best of your ability, then leave your name in unknown spaces and we'll follow up for more info. Each table includes appetizers and two bottles of wine. Contact organizer for information on Corporate Table Sponsorship. If you can't make it, but would love to support Spark Central patrons, you can donate here. We so appreciate your generosity. Description: Spark Central's mission is to ignite the creativity, innovation, and imagination necessary for people to forge the path to their best future. Our mission is driven by the belief that income should never be a barrier to discovering your creative power and using it to thrive.